I know that Friedman's book is more about global competition in the world market than it is about the arrival of McDonalds in Toledo Spain (which horrified me). But I can somehow see the relationship between the two. When every country has good education and access to the world market, we are going to have to work much harder to keep up. When cultures around the globe learn about the world market they are going to want to do what other developing nations are doing. Poor people really do want a lot of what we have. McDonalds is only the beginning. This is what happened to me when I complained about that McDonalds because the people of Spain were becoming more prosperous and it was changing their culture. "Yes" my son said, "watching poor people is very interesting!" He brought me up short when I regretted that all those beautiful third world cultures would never be the same. Then I realized why I didn't like those cultures changing. The attitude I had was selfish in that it said I didn't want people to have the privileges I have because it would not be interesting for ME. My thinking was that technology and the resulting Wal Mart and McDonalds was going to take away all the texture of our planet. Where was I going to travel to learn about the world the way it used to be? I was not happy about the world economy and our ever flattening planet because I wanted to be entertained. His statement stopped me dead in my tracks. See, I can remember the first time I visited Mexico many years ago. Ixtapa had just added a direct flight in from Los Angeles and even the stewardess were excited about buying the salsa to take home to share to friends. While the area had been a tourist destination for many years, the direct flight was going to make the place very popular with Americans. Waiters and waitress could not stop asking about the United States and they dreamed of going there. They were working very hard to learn English and their children wanted to practice with us to help themselves in school. While I loved the exchanges I knew that before long it would be changed. Nothing would be the same. I did not like that and bragged about being there back in the day before the Mexican people discovered the prosperity that a booming business might bring. When we were in Vietnam last time, we visited Sapa where we saw the culture unchanged and even flaunted for the benefit of visiting European trekkers and tourist. The remnants of the Vietnam war could be seen if you squinted your eyes. It was enchanting and interesting. 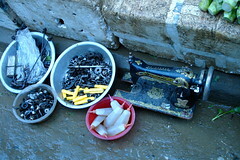 The women were set up in the market using WWII sewing machines and spare parts were sold from a bucket set along side a road. What a privilege it was to see that. 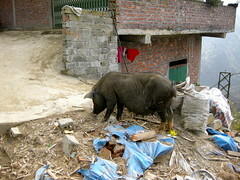 But we also saw the Hmong and Montinor tribal children playing beside huge creeks and near black Sapa pigs that ran wild. Their only clothing was a coat to cover their little bodies. The hotel we stayed in collected soap to give to the people so they could learn about cleanliness. 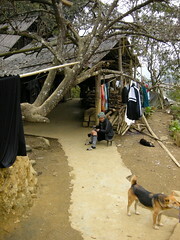 They fed the local tribe people a hot meal once a week. It was very primitive at the very best. At the time I found it charming in so many ways. Now, I see that these people may be happy but their children should not be cold and barefooted in December. There is plenty to go around. It would not take much to help these people see their true value in our world. Right now the world is simply using them for entertainment. We all know that travel changes us in ways we cannot even imagine. 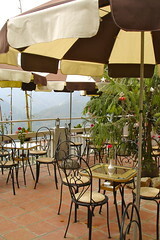 We learn new tastes in food, discover the wonders of new cultures and listen to the sound of a language unlike our own. It broadens our horizons and expands our minds. But the most important thing to me was that it made me appreciate what I had. It was a feeling that I had I it pretty good even though I was not wealthy in my world. In theirs I had it all. I occurred to me when my son said those words, that the Intel employees from Korea or India I see in my neighborhood all the time these days must be thinking it is too bad that there is an Indian restaurant on every corner or kimchi at our local grocery store. Don't they find that strange? Are they wondering what is happening to our world and wanting us to go back to an earlier time when we were more interesting? Maybe they would like the 1950's better? I can see when the shoe is on the other food, the whole concept takes on a new meaning. Now the final transformation has happened. I have come to realize a flat world is not a bad place. If poor people can be educated and learn to compete in our flat world, then they can live in a house with windows. Learning could be the norm and cleanliness a right and not a privilege. That really is what I want. What was I thinking? Really, how could I have not seen that even though these people are happy, they would be healthy and well fed too in a world more like mine? There is plenty to go around and every one can be raised up. When they learn to be a part of the 21st century both their world and ours will be better. Yes, travel has transformed me. I am not the same tourist I was. It is a good thing. What do you think? This post if part of a Blog Hop sponsored by Generation Fabulous called Transformative Travel. Leave a comment with a link to your blog about travel.